Outback Queensland’s traditional red dust imagery is awash with sparkling silver this week as the region’s tourism operators were recognised in the 2014 Queensland Tourism Awards, presented by Queensland Airports Limited in partnership with Tourism and Events Queensland. The Outback Queensland region’s five Silver Queensland Tourism Awards were among 80 organisational Awards and two individual Awards announced at Brisbane’s Royal International Convention Centre on Friday 28 November, where 900 guests gathered to commemorate the 30 year milestone. The 2014 Queensland Tourism Award presentations included 30 Gold, 28 Silver, 22 Bronze, two individual awards for outstanding achievements and one Commendation across 32 award categories. The 30th anniversary celebration of the prestigious annual recognition program, hosted by the Queensland Tourism Industry Council (QTIC), provided an opportunity to reflect on Queensland’s colourful tourism past and pay tribute to the dedicated pioneers who have shaped and transformed the industry. QTIC Chief Executive Daniel Gschwind congratulated the Outback Queensland winners and entrants. “The Queensland Tourism Awards give businesses and individuals an opportunity to take pride in their contributions to the industry, raise the standard of quality tourism experiences throughout the state and strive for ongoing improvements to achieve our tourism goals,” Mr Gschwind said. “Since 1985, the Queensland Tourism Awards have served to highlight tourism’s powerful role in driving Queensland’s economic and community development. “Tourism has been through its fair share of challenges, yet the industry’s commitment and passion has helped it remain resilient and strong – this is what has made Queensland tourism what it is today. Today, the industry employs more than 235,000 Queenslanders and is the second largest export earner for this state. Much of the credit for this success goes to the innovative businesses that have been recognised through the Awards. Individual Queensland Tourism Awards were presented to Peter Gash from Lady Elliot Island Eco Resort (The Marie Watson- Blake Award for Outstanding Contribution by an Individual); Bradley Illich from NewBook eManagement Technology (Young Achievers Award) and Rebecca Holmes from Mackay Tourism (Commendation – Young Achievers Award). Hall of Fame inductees are Brisbane’s Emporium Hotel (Luxury Accommodation) and Gold Coast’s Gwinganna Lifestyle Retreat (Health and Wellbeing Tourism), having both won Gold in their selected category for three consecutive years. Minister for Tourism, Major Events, Small Business and the Commonwealth Games Jann Stuckey said the Queensland Tourism Awards are a benchmark for industry excellence. “On behalf of the Queensland Government I would like to commend all of the award winners as well as the Queensland Tourism Industry Council for their dedication to the future prosperity of the industry,” Ms Stuckey said. Queensland Airports Limited (QAL) Managing Director Dennis Chant said celebrating the 30th anniversary of the Queensland Tourism Awards was a momentous occasion. “During the past 30 years, the Queensland Tourism Awards have successfully recognised the excellence in tourism products throughout the state and celebrated our industry’s impressive growth over the past 30 years,” Mr Chant said. The Queensland Tourism Awards are judged by a panel of industry experts who volunteer their time to assess written submissions and travel throughout Queensland to experience the amenities and services of nominated businesses. Gold winners from business categories in the 2014 Queensland Tourism Awards will gain automatic entry into the Qantas Australian Tourism Awards to be held in April 2015 in Adelaide. Queensland was well represented at the 2013 Qantas Australian Tourism Awards, winning 11 national industry accolades including four Gold Awards. 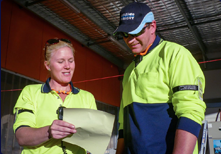 A total of 189 nominations were received from entrants throughout Queensland. QTIC is the peak industry body for tourism in Queensland, acting as “The Voice of Tourism”. QTIC is a non-government private sector, membership-based organisation representing the interests of the tourism and hospitality industry across Queensland. Note for Media: Media are asked to refrain from contacting award recipients until after 11pm, Friday 28 November 2014.